* Happerley audits, certifies and publishes food and drink supply chains. Happerley is not responsible for the client supplied information for Our Brand Values and Our Commitments. However, if you believe this information to be inaccurate please contact the Happerley Support team on support@happerley.co.uk. 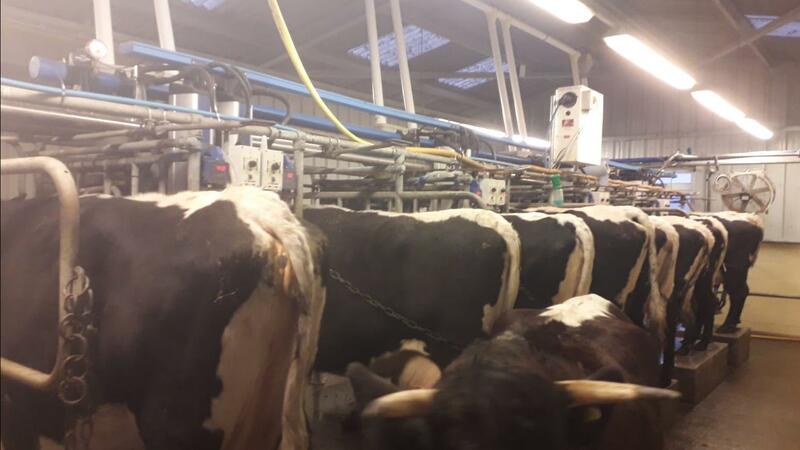 Limekiln farm is home to "The Old Gloucester Dairy" and sits in the tranquil hamlet of Hasfield just west of the river Severn between the historic city of Gloucester and the town of Tewkesbury. Its home to our beautiful herd of pedigree Gloucester cows and its here where we milk them and bottle the milk. Gloucester cattle are one of the oldest cattle breeds in the country. They are striking in their appearance with short up-swept horns and their mahogany body and unique white stripe down their back. Like most dairies we pasteurise our milk, this makes sure it's safe to drink. But unlike most dairies we DON'T homogenise our milk. This means you have a layer of delicious cream on the top! Homogenising forces the fats and proteins through tiny holes so that they become the same size and stop the cream rising to the top. Sadly, when milk is homogenised it does affect the taste and more importantly means the body can absorb more fat and less protein. All you need to do is bottle to mix the cream, or pour it straight onto your cornflakes so no one else gets the cream! Our milk is always fresh as we bottle 3 times per week and we can guarantee the quality as we test every batch through our lab, ensuring you get exactly what you expect. We can deliver to your door step or business. We supply selected shop's and Deli's, you can also find us online or if you would like you can just come to farm! Its a great shame that that so many dairy farms in the area have gone and you dont see dairy cows out at grass very often, so we are proud that our cows are grazed outside as long as the season allows us. We are major on home grown forage, like our hay that's from our meadows along the River Severn. A large area of the farm is meadow land and the meadows are a haven for wildlife. Over three quarters of the farm is managed under environmental stewardship which means we work around nature. For example, we never cut all our hedges in the same year leaving plenty of shelter and food for birds, also we never cut the grass for our meadow hay until the ground nesting birds have flown the nest.E We also have an extensive farming system that has great respect for the environment. 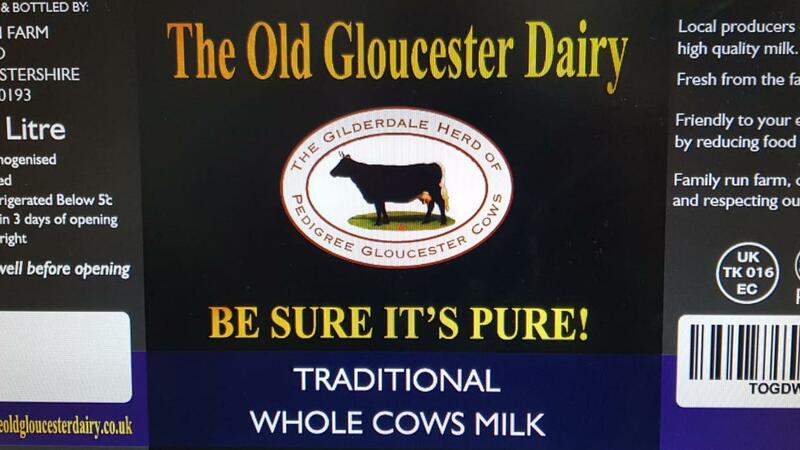 We are proud that we can supply the local community with very unique milk which is from the only herd of Gloucester cows that bottles its milk. All of our packaging is fully recyclable, also people return or we collect the empty bottles to make sure they don't go to landfill. This ensures they can be recycled and turned back into more bottles. We are currently in the process of creating a learning experience for local schools to come and learn about where their food and drink comes from. We invest in low energy systems, like our new vacuum on 'demand' for our parlour which reduces milking energy by 15%. A glass of milk is a source of protein, calcium, potassium, phosphorus, iodine, vitamin B2, B1 and B12. Animal welfare is paramount of importance for us here and we pride ourselves in having quality winter housing and grazing for our cattle. Gloucester's wouldn't be much good in a modern intensive dairy environment. Like me they don't like being inside more than they must! They are at their best grazing at pasture with the freedom of the farm, which is why that's exactly what we let them do . All animals should have the right to express themselves freely in their natural environment without being confined. They are also known for their docile nature and they love to stop for some fuss.